Download now to get local boiled and live crawfish prices in the palm of your hand. It's free. 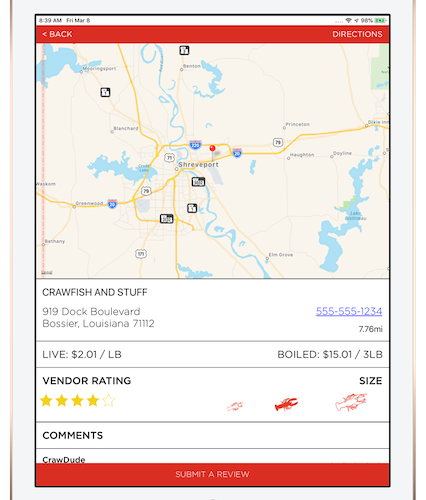 Use The Crawfish App to find boiled & live crawfish vendors in your area. With over 1,000 vendors across the South you are sure to find the perfect crawfish to satisfy your craving. All vendors are called by The Crawfish App team every Thursday and crawfish prices are updated by Friday afternoon for your weekend enjoyment (Prices are subject to change). If you are a vendor and would like to have your prices updated more often, text +1 (225) 803-0986. The Crawfish App is centered around finding you the best crawfish in your area. You can filter the local crawfish vendors by the best price, the highest reviews, or just the closest location. Show your favorite vendors some love by submitting a review. If you don't see you favorite vendor in the app, you can send us their information straight from the app. Once you have found the perfect crawfish vendor you can give them a call or get directions from the app. Our story begins in January of 2013, riding around our hometown of Baton Rouge, as Ryan is calling ten different restaurants to find out who is carrying boiled crawfish. “Why isn’t there an app for this?” Ryan asked.. and then in the same sentence he suggested we create one. 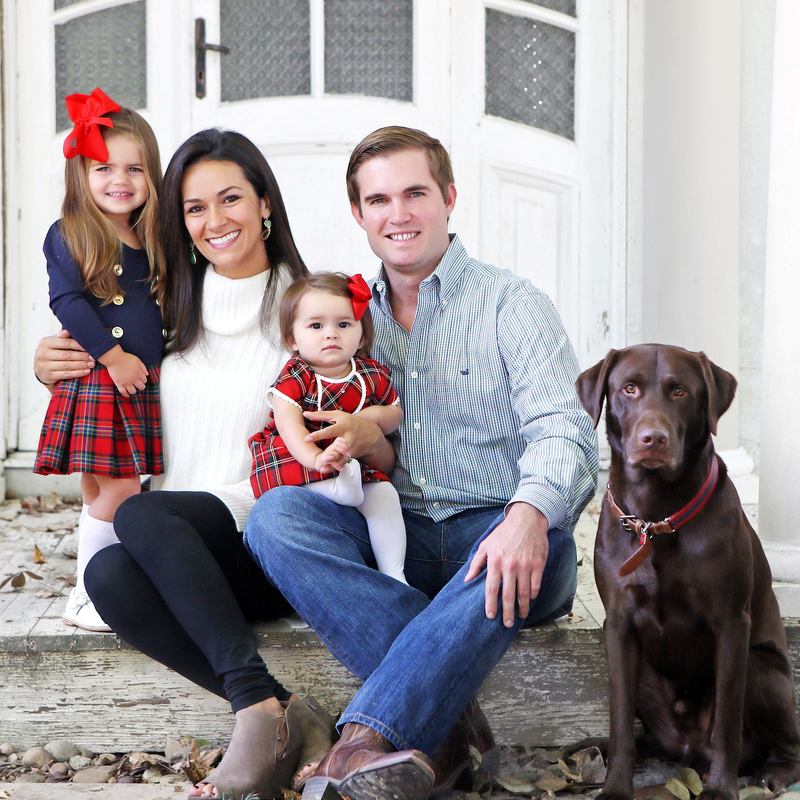 Fast forward 4 years, including 3 years of LSU Law School, 2 baby girls, and 1 chocolate lab... and The Crawfish App has finally come to life! Louisiana born and raised, we know what it means to be proud citizens of the Sportsman’s Paradise—endless festivals, delicious Cajun food, genuine hospitality, and of course crawfish boils… Good times spent with friends and family, celebrating everything from graduations to birthdays to Sunday Fundays—there is nothing quite like the experience created with boiled crawfish. We hope that you will accept The Crawfish App as our contribution to this great state and its residents. 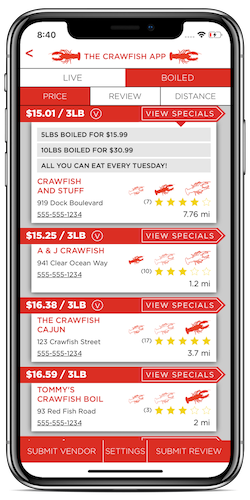 Our mission is to celebrate Louisiana culture and make your crawfish season even more enjoyable-- Download this FREE app for all of your live and boiled crawfish pricing, availability, and location needs. You can even review your favorite vendors and advise others where to go for the tastiest crawdaddies in your town. Cheers to you and our great state!